My 2nd Grade son is a mathematical thinker. As a math educator inside the system with a child inside the system my concern grows. Classrooms across the country have teacher concerns growing too. I know, I work with some pretty fantastic teachers and I am listening to their struggles every day. My son has a natural ability to move around numbers in his head. This has been happening since he was four years old. I often wonder if his Montessori School experience provided him with the foundation he needed to make sense of numbers. I think back to all of his work places and the beads and the boxes and the tiles and the sticks. He constantly was building tens. As a parent, I was thrilled. I remember tucking him into bed and him asking me to give him math problems. I always said, “After Story Time.” Story time would come to an end and I would shoot out 9 + 8! I was perplexed. This is before Kindergarten. “How did you get that so fast?” I’d inquire. My heart overflowed. Bubbled. Celebrated. He was making numbers friendly first. Then dealing with them. As a math specialist in my school district this was exactly the number sense we were aiming for in our students. 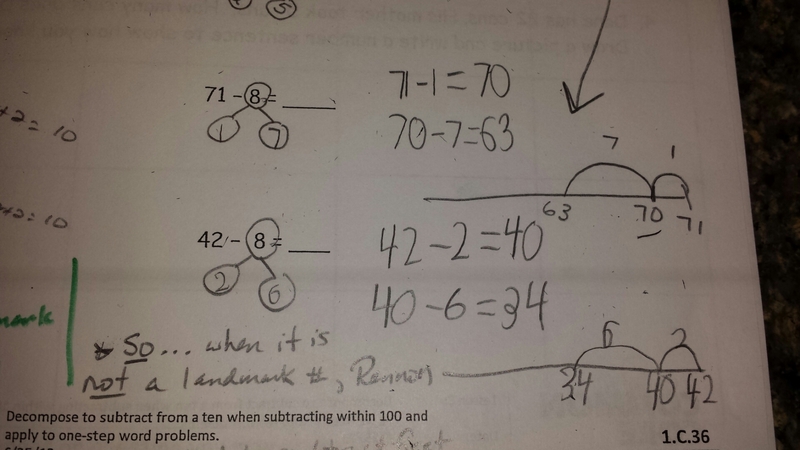 Rather than memorizing 8 + 9 = 17 as an isolated fact without understanding of addition, the goal was to provide students with these quick and efficient strategies. Fluency and automaticity were definitely not an issue. This is the worry of many from the public…. our children do not know their basic facts. My belief is they do not know their basic facts because often times they are doing “sprints” and “speed tests” with a set of random facts their brain must “just memorize” with no sense making of the numbers. Over time, there is so much to just “memorize” the brain shuts down. Children are expected to be speedy with concepts they do not yet understand. Research has shown that practice makes permanent. If they practice for speed what they do not understand, then the misconceptions are imprinted in their brains. “So how did you get 14?” my next question. He persisted in asking for harder problems. I took a chance, “What is 96 – 8?” Remember he is approaching kindergarten. I proceeded to give him two digit subtracting two digits and his strategies led him to an accurate answer each time. My debate within myself of where to send my son to school waged its own war within my head. After much weighing, I sent him to his neighborhood school so he could be with his neighborhood friends. We struck gold with his kindergarten and 1st grade teacher. Both teachers created an environment of exploration and fostered his curiosity. His math was very solid, so my concern was that he be placed with a teacher that really understood literacy development and his reading would skyrocket. Happily, his reading did skyrocket and ended his 1st grade year at least one grade level above his own grade level. I wasn’t concerned too much with his math….. yet. He mentioned often how easy math was to him and it wasn’t challenging. I knew this would be something I would have to face in the future….. a bridge to cross to figure out how to put him in an environment in which his mathematical mind would flourish. My son’s school is a looping school. I love it. He would have the same teacher for 2nd grade he had for 1st. And I adore her….. The sparkle in her eye gets me every time I see her. Many, many, many years of teaching under her belt, and a “master” with every child she touches. Now, dim the lights. Imagine walking down into a dingy basement. It is cold. The scary music plays. Slowly you creep down the stairs…. What’s at the bottom? Your heart rate increases, sweat breaks out……. Oh Crap! Two new programs hot off the press enter on the scene. Journeys and EngageNY. Oh. Just that? Harmless enough? Actually think three times and ask if these two programs will be the magic bullets? All children at standard, all children eager for college. Hmmmmmm………. My son’s lovely teacher is buried in implementing two new programs and under the new teacher evaluation system (TPEP). At parent/teacher night she scrambled to explain the new literacy program and its alignment to common core. She said to give her time to figure it out and learn the new program. This is a woman who created a love of learning in every one of her students and many achieved high levels in reading LAST year. But now, this new program hits the scene. I emailed his teacher. I have the highest regard for her and let her know this almost weekly. She empathized. Later, another email came from her letting me know her team had revamped Journeys and figured out a way to put Literacy Stations back into the day. She also was going to be designing some special projects for the students so they could start exploring and reading about things that fascinated the children. And now…. a monthish into school, her team decides to attack EngageNY. Their grade level was the only one not doing it at my son’s school and she explained her fear of her students going to next grade level without the experience, vocabulary, and strategies. Great Heart. Great Intentions. She sounded just like me a year ago, when my previous staff was deciding to implement one new program or both. The teachers in our district were given the “choice” of doing Journeys, and staying with old math program OR also implementing EngageNY. My tune has changed as I stand in the trenches alongside teachers using EngageNY. I am living and breathing Engage NY. I am also listening to my son tonight and had to speak out. My son pulls out his homework. I examine it. I know his effective strategies and I stare. No way was I making him solve it like the example. Next column. Remember when he was a kindergartener and solved 96 – 8? Above. Eloquent strategy. So we worked through these next column of problems utilizing HIS strategy and I showed him how to capture his way of thinking. If you go back up and examine first part of the assignment, my son’s strategy does not match, yet I believe his is much more eloquent and quick. He did all of this in his head of course. 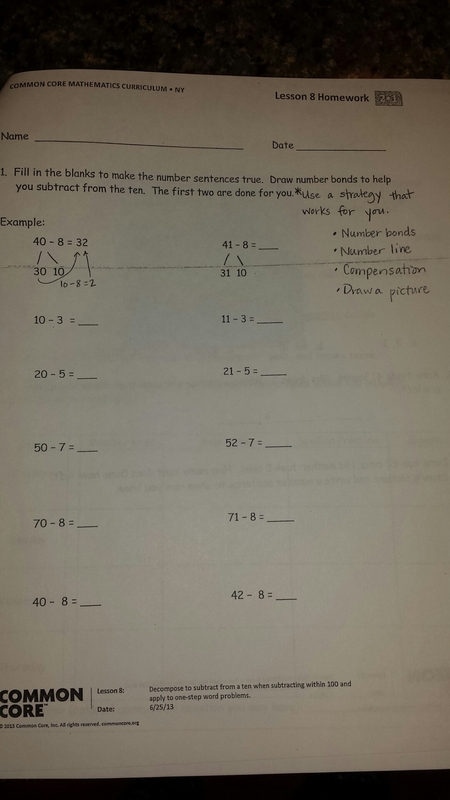 I worry about some posts I’ve seen go viral with all the steps in math with the new common core. What you are seeing above is what my son did in his head. Because I wanted to capture his strategy, we broke it down like is seen in the picture. It is important at this stage of development to help children “see” their strategy. My intent is not for him to have to do more steps, rather it is merely a way of showing the process happening in his brain. EngageNY was paid for by New York States Department of Education. They contracted with a company in Washington D.C. called Common Core, Inc. Because it was paid for by a grant, $27,000,000, it was made “free” to whomever wished to use it. Then a company emerged called Eureka Math. The same people who wrote EngageNY, Common Core, Inc. started Eureka Math. Eureka Math bought the rights to EngageNY. The public still can view EngageNY for free and use it for free, but any and all updates and improvements are now owned by Eureka Math. The difference is Eureka Math is not free and must be paid for to use it. This is just a side note so parents around the United States understand that EngageNY and Eureka Math are essentially one in the same. Are these programs “unteaching” our children? Are our children’s natural curiosity flourishing? Is creativity, innovation, imagination, and the love of learning alive and well? Think about the number sense my son has mastered. 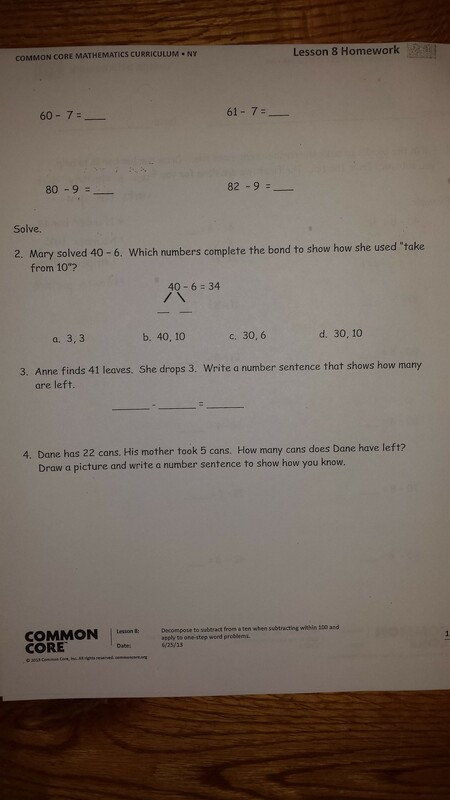 Does this homework help or hinder his mathematical growth and understanding? How much time is he now spending on testing with this new program? It comes with daily problem sets, exit slips, mid module assessments, and end of module assessments. I believe many teachers believe this program isn’t the answer nor will it foster future mathematicians. I believe many teachers are scrambling for ways to breath life into this program and align it with researched, best practices. It is a given that children learn by doing and need hands on experiences for learning to go into long term memory. 5th grade teachers struggled to teach the first module on decimals with students who came to them with little mastery of whole numbers. How do you think their students performed on their mid module assessment after one lesson on adding decimals, one lesson on subtracting decimals, then onto multiplication and division of decimals? Did the students feel success? 6th grade teachers shared the end of module assessment took 3 hours and for some 4 hours in their classrooms. One 6th grade teacher reported her top math student said, “I hate math,” after throwing her pencil down near the end of the test. The lobe of the brain that utilizes reasoning is not solidified until at least 12 years old. Yet our children are being stuffed like turkeys and made to reason before they are ready. Can you imagine grandparents and parents getting frustrated with their baby when it isn’t walking by 6 months? Next, deciding to put their child through drills and test them at the end of each week to see if they are closer to walking? Who cares? They will all walk! Thanks for writing this Raz! Second grade with EngageNY math was a nightmare. My daughter would spend most nights under the table crying instead of doing her math homework. Yes, it was that bad. In order to keep my sanity, I ended up volunteering during math EVERYDAY. Basically, it was easier for me to repeat 2nd grade math than try to figure out the EngageNY “strategies” and “vocabulary” on my own. Most parents don’t have that luxury.